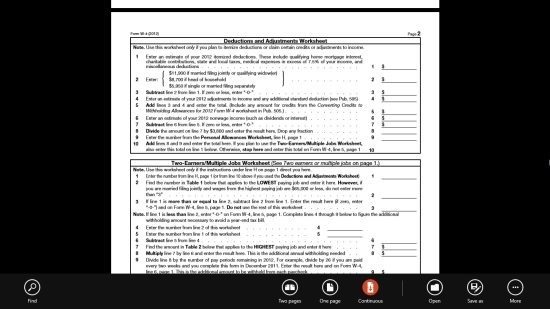 Reader is a free PDF Reader for Windows 8 that allows the users to read PDF files directly on Windows 8, without searching for any PDF app online. This Windows 8 app comes up with the very new Windows 8 Metro-Style interface that lets you read a PDF file in Windows 8 big HD screen. The app is very safe and secure that protects PDF files from virus and malware. Now, Windows 8 users can read a PDF file or other important document in PDF format and that too in just a few seconds, without installing any separate PDF reader in your new system. PDF Reader is very ease to use. Once you have successfully installed the Windows 8 PDF Reader, use the available options such as two pages, one page, continuous, find, save as and many more. With “Find” option, you can find about any topic in case file is too long by entering a name of topic in the search bar. With “One Page” option, you can view only one page at a time and with “Two Pages” option, you can see the two pages at a time. Within “More” option, you can use the rotate and info options. You can rotate the file in the position you want and can get the basic info about file with “Info” option. The best part of this PDF Reader for Windows 8 is that it also support XPS format along with PDF format. Also, check out our post on another PDF Reader For Windows 8. Supports PDF as well as XPS files. Protects the files against virus. Reader App is an excellent Windows 8 app for the people who works on documents on regular basis. Try PDF Reader for Windows 8 available Windows 8 App Store.